To receive the grace of Lord Hanuman images, all devotees worship Lord Hanuman in different ways, in which regular Hanuman Chalisa and Hanuman Bajrang Baan are devoted to Hanuman Ji after reading Bajrang Baan. Reading of Hanuman Chalisa and Bajrang Baan should always be spoken, while the mantra should chant in the mind. The magnificence of Hanuman Ji Bajrang Baan is immense. It is believed that for those devotees who regularly chant the Bajrang Baan, it serves as an accurate weapon. Using the Bajrang Baan for the accomplishment of any work, the work is definitely proved. Gayatri Mantra is considered to be the easiest mantra of the world, but Hanuman Chalisa and Bajrang Baan are more effective than Gayatri Mantra. Many such mantras of Hanuman Ji are popular, but there are many such mantras that never go empty and one of those mantras is Bajrang Baan. The regular Chant of Bajrang Baran, the ritual in any home, family, unfortunately, poverty, ghastly rage and incurable disease, physical pain never persecutes. In the short period of time, the person who is unable to do regular lessons should do this lesson at least every Tuesday. The regular whole Chanting of Bajrang Baan in hindi is capable of defeating the whole tragedy in the life of any person, gross anger. Chanting and recitation of the Hanuman Bajrang Baan in English on Tuesday or Saturday. On this day, the devotees can keep fast for the happiness of Hanuman ji ki aarti and Shani dev chalisa. Through the regular text of the Hanuman Bajrang Baan, all the discord and anger associated with the body, mind and wealth are dispelled and physical pleasure are attained. Pawana suutah Hanumana ki jai. If you are very upset with enemies and opponents, then chant the Bajrang Baan on every Tuesday 11 times. If you are very troubled by enemies and opponents in self-confidence and courage by regularly reciting Bajrang Baan, then chant the Bajrang Baan on every Tuesday 11 times. Regular recitation of hanuman Bajrang Baan increases self-confidence and courage. Children who are vulnerable or have some fear before doing work, they should be instructed in the Bajrang Baan. If every task seems to be in turmoil, it is beneficial to read Bajrang Baan on Saturdays 21 times. 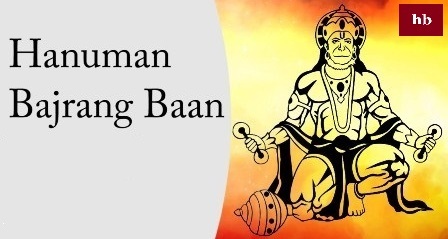 If your business is experiencing a constant loss, then chant the Bajrang Baan on 8th Tuesday at your place of business or get it done by a qualified royalist. You must get the benefit. Growth happens. Typically reading the Bajrang Baan to heart patients and blood pressure patients has special benefits in health. If you are going to give an interview, go through 5 times the Bajrang Baan and get success. If your business is experiencing a constant loss, then chant the Bajrang Baan on 8th Tuesday at your place of business or get it done by a qualified royalist. By regularly Chanting Bajrang Baan, freedom from fear in all respects gives rise and confidence increases. If you have trouble with your enemies, then chant Bajrang Baan regularly 7 times and in 21 days your enemies will start losing. To increase your business, chant Bajrang 7 times on 5th of your office. Those who make up-made works, they must read the Bajrang Baan in their daily worship. Regularly Chant of Bajrang Baan communicates positive energy along with increasing courage in the person.